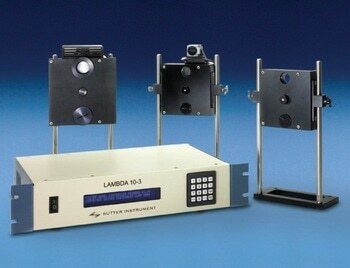 The Lambda 10-3 is the most recent addition to Sutter’s high performance filter wheel changers. The controller now provides expanded communication interface options, synchronous independent control of 3 filter wheels and 2 shutters (or 2 filter wheels and 3 shutters), and faster switching times. Recent improvements in motor technology allow this filter changer to achieve switching times of 40 msec between adjacent filters. Additionally, it is now possible to access the controller commands via parallel, serial, USB, and keypad interfaces. The Lambda 10-3 is capable of monitoring a wide range of standard Sutter filter wheels including the popular 10 position 25 mm wheel, a compact belt-drive 4 position wheel, a 5 position 50 mm wheel, a 10 position 32 mm wheel, and a lighter 4 position 25 mm wheel. The embedded controllers automatically detect the equipment installed and the source of the external commands, so there are no jumper wires or switches to set. The rate of movement can be optimized in accordance with the load of the wheel with the help seven speed settings. The Lambda 10-3 can operate up to 40 msec switching time with the conventional 25 mm filter wheel, as well as Sutter’s latest high-speed 32 mm version. Additional speed is provided by the 4 position wheel (LB10-NWHS4), which also helps achieving switching times of less than 33 msec. A direct drive system is used by almost all of Sutter’s filter wheels. This design removes problems related to belt slippage and backlash, guaranteeing that the company’s wheels are exceptionally robust. Each wheel will accommodate filters from 1 to 9 mm in thickness, allowing the use of multiple filters in each position. For example, this allows users to insert a neutral density filter along with an interference filter in a single position. Sutter have designed the body of the filter wheel with a trap in order to eliminate light scatter. For extra stability, non-emission filter wheels are available with a sturdy support stand and 12 inch rods. In addition to filter wheels, the Lambda 10-3 controller also supports Sutter’s patented stepper-motor controlled SmartShutter® and the Uniblitz® shutter. It is possible to mount either shutter directly onto the wheel, providing a compact shutter/wheel package for systems with mounting constraints. Both non-shuttered and shuttered filter wheels can be installed directly on the microscope in several locations: the trinocular head, Keller ports, emission, and excitation. It is possible to use up to two excitation and/or neutral density filter wheels with the Lambda LS xenon light source and liquid light guide, in vibration sensitive systems. The SmartShutter can be mounted separately from the wheel in any location in the light path (including the Lambda DG-4/DG-5 and Lambda LS), and driven in a stand-alone configuration by the Lambda 10-3 controller. The microscope specific adapters necessary for any configuration of wheels and shutter are listed in the Microscope Adapters section of the catalog. The Lambda 10-3 commands are a superset of the Lambda 10-2, integrating all earlier available features into the new design. The third wheel as well as the special SmartShutter features are accessed by the inclusion of additional commands. These configurations can be programmed through the keypad, allowing easy use of the earlier shutter commands in order to access the SmartShutter specific functions such as the neutral density or the 'soft’ shutter mode. Filter selection can be performed directly from the keypad or from a computer via the serial, parallel, or USB port. An acceleration/deceleration algorithm minimizes vibrations when the wheel is moving and the controller determines the shortest route to the selected filter. Internal sensors ensure correct filter positioning and current filter position is displayed on the front panel. RS-232 level signals are accepted by the serial port through a DB-9 connector. USB input is made through a standard connector and can be directly connected to a PC USB port. The universal power supply will automatically switch to accommodate the line voltage, and user adjustment is not required. An optional liquid light guide is available for applications requiring absolute vibration isolation, and/or spatial illumination uniformity. The Sutter filter wheel systems have always been optimized for rapid switching of a lightly loaded wheel. An increase in the time needed to switch from one filter to another is required by the added mass when several thick filters are installed. A major improvement is seen in the switching times with filters made on a thin substrate that do not need a thick layer of extra glass in order to obtain the desired blocking. Semrock® has the required coating technology to offer filters with substrates down to 2 mm in thickness. Sutter has now taken the additional step of designing a special threaded ring that Semrock can install in place of their typical plain filter cells. Filters mounted in these rings can be threaded directly into the body of the filter wheels when Sutter’s standard filter cups have been removed. Semrock filters weigh less than the filter cup and retaining ring generally used to mount filters in the Sutter wheels. So, if Sutter’s filter cups are removed and the new threaded filters are mounted directly in the wheel, even a fully loaded wheel will be able to operate at speeds that previously could only be used with just two filters installed. Semrock is currently ready to provide filters for Sutter’s 25 mm filter wheels with 32 mm filters available shortly. Installing these filters in a Sutter wheel that has filter cups, will require the cup to be removed from the position the user intends to use in order to mount the threaded filter. The new wrench can be used when installing the new threaded filters as it has been designed for this purpose.